Booker Talk is welcoming two additional members of the team this year. Growing up, I was the avid reader stereotype. I would arrive at school every day with at least one non-syllabus book in my bag. My tutor encouraged my passion, asking for recommendations, and marvelling at the (ridiculous) number of texts I consumed in the holidays. I was the real-life Rory Gilmore. Yet, at some point something changed. I went to university to study English and History. And to be perfectly honest, I would be slightly ashamed to reveal the number of books that I’ve managed to read in the past 2 years. Don’t misunderstand, I genuinely loved university. But I’ve only recently realised the damaging effect that it had upon my relationship with the books that I once loved. I can’t possibly speak for all subjects, but I can say the amount of reading English and History departments require is, frankly, ludicrous. At least one book per week for English (often two, and more for single honours), and probably five or more accompanying chapters. For History it was ten to twenty academic texts a week. These were upwards of 60 pages, and incisive notes were expected – plus your other work. I only had 5-10 weekly contact hours, but I was still in the library daily between 9am-6pm, pouring over the pages and pages spread over all surrounding desks. As I said, I loved university, so I’m genuinely not trying to complain. But when your time is spent reading for work, it’s difficult to read for pleasure. You can no longer just be absorbed by a text. Now you subconsciously consider all possible meanings behind every syntactic choice. Books I used to adore I haven’t touched in years. I’m unable to detach them from the indecipherable notes scrawled down whilst my tutor shared his wisdom whilst going a million miles a minute. There are the books I didn’t like, those I had no say in reading. In my first year I had no influence at all over the English modules taken, and they were often not my taste. I enjoyed them at the time, but that’s a year spent on texts I will never revisit, never look back on in fondness. Although I hate to admit it, the lack of reading for pleasure whilst studying may have had something to do with the fact that it was around the time I went to university that Netflix really took off. When the options are either struggling through a translation of Middle English or watching the newest season of Orange is the New Black, I think I’ll go for the latter. The thought of reading too much else outside of these hours was just fairly exhausting. So how am I trying to move on? Firstly, I’m only reading the books I truly want to. If it’s recommended and sounds like my cup of tea, great. If not, I won’t pretend it’s going on my ‘To Be Read’ list. Finally, I am setting myself personal targets. These are just for me, and will be adjustable to reflect the realities of the rest of my life. Don’t worry I won’t be popping these on GoodReads, I’d probably end up feeling inferior! I still love books, I’ve never stopped. I think I just had to take a break for a while, to regain my senses. As I’ve said, I really did love university. I just hate that it temporarily ruined my relationship with literature, without me really being aware it was happening. Book blogs should come with a surgeon-general style health warning. For those of us who have an inborn disposition to collect more books than one human can possibly need, reading such blogs is akin to letting a child loose in a sweet shop with unlimited funds. I’ve long had a propensity to acquire books but, in the last year the combination of discovering scores of great book blogs, joining a book club and taking part in some reading challenges has meant my mountain of books yet to be read has now achieved Himalayan proportions. I’ve used every inch of shelf space in the house and outgrown the storage boxes which were meant to be temporary solutions until I cleared out the shelves. My most recent acquisitions are consequently stacked in piles in various corners of the house, attracting many deep sighs and glowering looks from Mr Booker Talk. Action is clearly needed. Mount TBR needs to be taken down a size or two. But how is the question? Having given this much thought in the last few days I’ve realised that, much like dieting to get rid of fat, there are really only two approaches — restrict the input or step up the output. Since there is no Slimming World or Weight Watchers for Readers as yet, I’ve had to come up with my own ideas. 1. Cosmetic surgery. A drastic option in which I’d chop down the mountain with a few nip and tucks here and there. A cull of books (especially non fiction) I’ve had lingering in the back of the cupboard for years, would certainly bring some relief. There are certainly enough candidates for a cull. There’s Charles Handy’s The Empty Raincoat for a start. It’s lain unopened since I bought it at least 5 years ago And then there’s David Smith’s The Dragon and the Elephant: China, India and the New World Order, that bought in 2009 after a business trip to those countries. However much my yearning to sound knowledgeable about world affairs, tealistically, the answer is that I’m unlikely to get around to these for some time so why hold onto them? The answer is that it feels such a waste of money. Perhaps I’ll hang onto them for another year and if I’ve not so much as opened them during that time, I’ll put them up for sale. 2. Go on a fast. Another drastic action. In other words stop buying books. Stop borrowing books from the library. Stop getting free advance copies from publishers. Stop downloading free e-copies from Project Gutenburg. Drastic measures these. I could manage this for say three months but I’m sure my resolve would wobble after that. And three months of this diet, given my rate of reading, isn’t going to make much of an impression on the stack of unread books. 3. The calorie controlled approach. If complete abstinence isn’t likely to be something I can endure for long, how about if I stopped buying/borrowing/downloading everything for the rest of the year except the books chosen for the book club read? Given that I already have July’s read and I will probably skip August since I don’t like the sound of the selected book, that means I’ll only be buying four books between now and Dec 31. Problem with that is, I might end up wasting ‘calories’ on books I don’t really enjoy. 5. Pump up the volume. I thought I was a quick reader but compared to the eye-watering number of books some bloggers seem to read, I am way behind in the field of runners and riders. Short of taking a speed reading course (which seems rather pointless) or taking early retirement (please!!) , my ability to get through more books in a year is rather limited. Maybe if I focused on the shorter novels in my collection, I’d feel psychologically that I was getting somewhere. And there you have it. A plan, though not one I approach with any relish. I think I’ll have to start with the softer options of numbers 5 and 4 and build up my courage for the others maybe next year. How do you all tackle this issue? Anyone tried a fast or the calorie controlled approach? Did it work?? Let me know if you have any bright ideas to share. 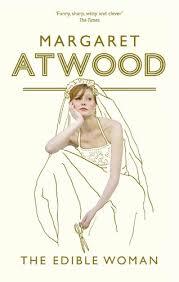 Margaret Atwood‘s first novel, The Edible Woman, was considered a landmark novel when it was published in 1969. Although Atwood later described her work as protofeminist rather than feminist, her themes of gender stereotyping and objectification of women, reflected some of the central concerns of the burgeoning women’s movement. Her protagonist is Marian McAlpin, a young single woman on the verge of marriage who feels torn between the role that society expects her to enact and her desire to be her self. Her body’s rejection of food becomes the manifestation of her rejection of the female normative behaviour. First she discovers that meat – anything with “bone or tendon or fiber” – revolts her, then the same thing happens with eggs, carrots and rice pudding. By the end of the book she seems to exist on little more than a few salad leaves. Will she or won’t she wed is a question that gets resolved in a truly imaginative way right in the final pages. It’s about the only part of the book that I enjoyed. The rest was a plod to the extent I wouldn’t have bothered reading beyond about page 70 if this hadn’t been the monthly book club choice. Accepting that the issues with which it deals have moved on significantly since the late 60s so didn’t have as much resonance as it did for contemporary readers, my main issues were that I didn’t feel any empathy with Marian – in fact I found her passivity tiresome – and I was lacking the sparkle that I’ve experienced in Atwood’s other works. Here is a woman who knows that her fiance Peter treats her with little respect, almost like a child. He constantly tells her what to wear and how to act, and she is uncomfortable that his love-making gives her the feeling “she was on doctor’s examination table” or that he regularly rests his ashtray on her back as though she were a a table. Yet she doesn’t say anything or do anything to change the situation, just drifts along with the status quo. The other characters are even less likeable; actually I found them distasteful. There’s her flatmate, Ainsley, who decides she wants to have a baby without having a husband because she thinks they ruin families. So she seduces someone, gets pregnant by him, doesn’t understand why he should be so angry about being used by her and simply tells him she wants nothing more to do with him But when she reads that children raised without fathers are liable to be homosexual, she changes her mind and begins insisting he marries her. Another friend is married to someone who thinks the answer to the problem that educated women lose their sense of individual personality when they get married, is for her to produce lots of babies and attend the occasional evening class. The Edible Woman launched Margaret Atwood’s as a prose writer of major significance. I’m so glad that it wasn’t the first I read by her because I would have been highly unlikely to read another. And that would have meant I missed out on gems like The Handmaiden’s Tale and Blind Assassin. The good citizens of a community in San Antonio, Texas might have beamed with anticipated pleasure when the city fathers announced they were getting a new, purpose- built library. It was big news for a community that doesn’t have a bookstore and has never had a library to call its own. Not unreasonably, many of its residents expected that part of the $1.5M cost would go a long way to paying for a few books. Imagine their surprise to learn that theirs will be the first bookless and paperless public library across the whole of North America. Many libraries around the world are switching funding from the purchase of paper copies of books, to buying digital versions. Just last year Imperial College in London announced that over 98% of its journal collections were digital, and that it had stopped buying print textbooks. Other academic institutions have experimented with this approach, particularly in their science and technology faculties. But the new BiblioTech facility in Texas will be the world’s paperless public library. 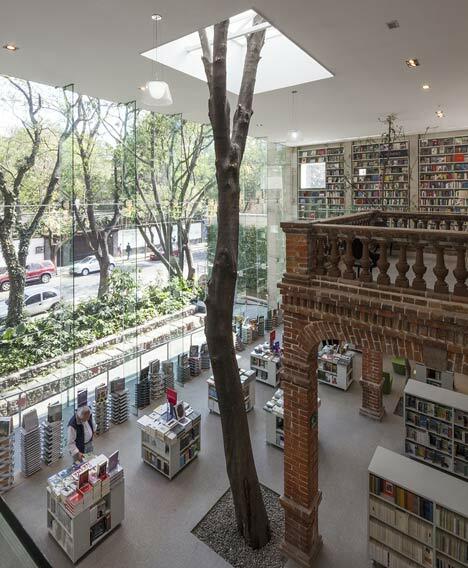 Readers will visit the Apple-inspired building to download e-books directly onto tablets, smart phones, PCs and e-readers from an initial collection of around 10,000 titles. If they don’t have their own devices, they’ll be able to borrow one apparently. Traditionalists (and I hold my hand up to being one of them) might react with rolling eyes to such comments. The first time I saw this picture I imagined that using it would be an antiseptic, soulless experience completely alien to the musty, dusty but oh so atmospheric libraries of my formative reading years. Even now, as libraries have modernised and refurbished, I still can’t imagine getting the same thrill from selecting a book from an on line catalogue rather than taking it down from the shelf and browsing a few pages before deciding if it’s for me. Orange walls and green bar stools don’t make the experience any more pleasurable. If they were going to spend a few million dollars, couldn’t they have done something inventive and pleasurable. 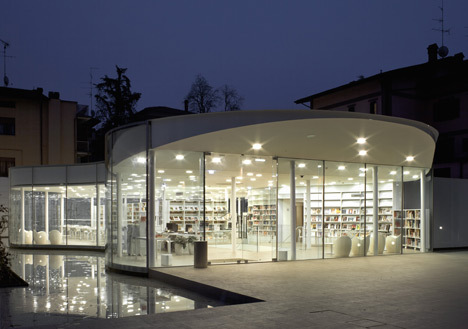 Like this new library in Maranello, Italy which seems to float in water. Faced with rapidly growing populations in suburbs and satellite towns outside the San Antonio city limits he knew the residents of these areas wanted more services. But no-one would be happy to see their local taxes escalate to pay for them. His plan not only gets people access to a library for the first time, he’s doing it at at a significantly lower cost than the traditional approach. And he’s given the new facility a very strong community education focus through partnerships with local schools, digital literacy courses and late opening hours. The new BiblioTech site is due to open later this summer. Whether it will get the positive reaction the officials are hoping for, therefore remains to be seen. There was a public outcry in Newport Beach, California in 2011 when residents learned their city was planning a bookless library. Eventually the city fathers backed away from the plan. Will Buxton become a failed experiment or will convenience and the preferences of a new generation of readers prevail? One comment from a local father could hold the key.